Call me crazy but I'm still turning on the oven and baking away in the midst of this sizzling hot summer. Thank goodness for air conditioning! When it comes to routine or relaxing through baking, I think of cookies and muffins. They're easy, low-maintenance bakes that are always appreciated around the house. It is undeniable how convenient it is to grab and plate a muffin or two for breakfast on a busy weekday morning, whatever the season! This time, I made muffins and I zoomed in on one of my favorite flavor combos: pistachio and orange, with a little chocolate thrown in to make it even better. I'm quite fond of this combination in cake and cookie form and I've been itching to make a muffin version, so here we are. This is a tender muffin, not too sweet, nor too rich. I didn't feel like I was eating a cupcake in disguise and that could be a good or bad thing depending on your perspective. You could easily make and top these muffins with a spoonful of glaze (confectioners' sugar mixed with a bit of orange juice or milk) to add extra sweetness on top. I didn't since I figured the chocolate provided enough richness. While the recipe I started with called for yogurt, I substituted with buttermilk, which was what I had on hand. A little fresh orange juice and zest adds bright fruitiness and I tossed in a little vanilla extract to complement it. Chopped pistachios are stirred into the mix (I reserved some to sprinkle on top). Finally, I added some finely chopped dark chocolate. I really liked the chocolate (no surprise there, I suppose) and, in retrospect, I actually wish I had added more because, inevitably, you keep looking for that chocolate bite! I hope your summer is going well! Are you baking muffins or too busy for that and just grabbing them from your local pastry shop? Summer is a funny time - it's both leisurely and hectic all at once. I feel the urge to cram in as much as we can because the responsibilities and chill of autumn will surely come and change everything in a couple of months. But at the end of the day, as much as I look forward to vacations and trips to the beach during the summer, I'm a homebody and eager to spend time cooking and whipping things up in the kitchen. I think I'm achieving a healthy balance so far this summer. Here's to the happy days of summer, doing all the things we love best! Preheat oven to 375 degrees. Line a regular muffin pan with 7 paper liners. Place butter and sugar in the bowl of a stand mixer. Add orange zest and rub it into the sugar with your fingertips until it feels slightly moistened. Cream mixture together, scraping the bowl as needed. Add egg and beat until well incorporated. In a measuring cup, whisk together the buttermilk, orange juice, and vanilla extract. In a bowl, whisk the flour, baking soda, and salt together. Beat the dry ingredients into the batter in two batches, alternating with the buttermilk mixture in between. Add all but about 1 heaping tablespoon of the pistachios (this will be used to top the muffins) into the batter; add the chopped chocolate. Stir together with a rubber spatula until just combined. Divide batter among the muffin cups. Top each with a sprinkle of the reserved pistachios. Bake until a tester inserted into the middle of the muffin comes out clean, about 15 minutes or so. Remove muffins from the oven onto a cooling rack; let cool in the pan a couple of minutes and then gently remove each onto the rack to cool to room temperature. They look amazing and I love the soft and moist crumb of these muffins. Wow the texture and flavor combination looks wonderful! I wouldn't put icing on it either - sometimes it is great to taste the muffin instead of the icing. Have a lovely weekend! I agree...keeping it simple, tasting the muffin itself is a good enough treat for me, too. Enjoy the rest of the weekend, Tricia. Muffins are always worth turning the oven on for :) These look SO delicious, Monica! I love the pistachio and orange combo and adding chocolate makes them even more special! I'm with you, summer goes by so fast so we are just trying to enjoy every moment we can by cramming everything in. Have a great rest of the weekend! Thanks, Kelly. Enjoy your Sunday! So true, summer is just flying. What’s not to love about this droolicious flavor combo!! We all love muffins in my family and this orange + chocolate + pistachio combo is so divine. Pinning it! These muffins sound absolutely perfect - like you, I prefer them a little less sweet. I've bookmarked the recipe and can't wait to try it! Hope you do, Beth. Sounds great! Your muffins and a cup of tea sound like a nice way to start the morning. I always have a bag or two of pistachios in my pantry as they are very good for your eyes and now I have a new way to get them into my diet. I didn't know pistachios were particularly good for our eyes but I'm very happy to hear it. I keep a jar of mixed nuts and snack on them everyday. Pistachios are one of my favorites but I like them all! They look so perfect. Delicious combo. I love how soft and moist they are. Love your recipes dear! Thanks so much, Kushi...very sweet of you to say. I bake all summer too! The heat doesn't stop me. Haha. Love these muffins! That's sweet of you to say, Pamela. My oven's been having some issues heating up lately so I made be forced to take a break, but I hope not! Stay cool. These muffins sound and look fabulous...I like the combination you have here...pistachio, orange and chocolate...yum! 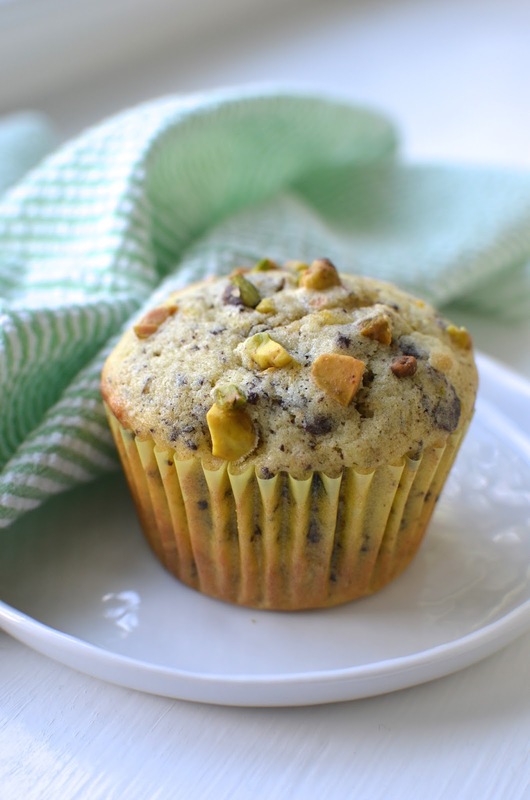 Pistachios, orange and chocolate is just such a fabulous flavor combination! I absolutely LOVE THIS recipe for the muffins! Especially amazing for breakfast! The best bit is I can literally bake a large batch and just grab a muffin and some coffee and be on my way to school! How amazing is that! Gives me more time to sleep haha!!! Making muffins is practical, isn't it?! ; ) I'm glad you like them, Samina...thanks! This combination is outstanding! I can almost taste them from here. Even the texture is so perfect. I wonder if I could stop at one..NEVER! Hi Sonali - muffins are just so easy and I like expanding my repertoire. : ) Anything with chocolate and nuts is right up my alley. Yes, we are definitely on the same page. : ) Hope your summer's going well!